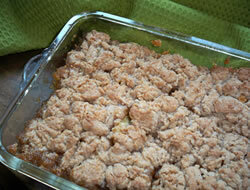 Combine 1/2 c. sugar, lemon juice, water and cinnamon in bottom of small baking pan. Slice in apples. Blend remaining 1/2 c. sugar, flour, salt and butter until crumbly. 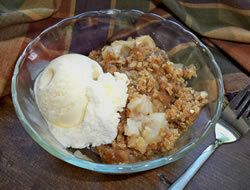 Spread over apples and pat smooth. Bake at 375°F. 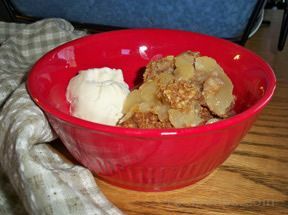 for 40-50 minutes, until apples are tender and crust is browned. Serve hot with ice cream.